March 06, 2019 - Your scalp goes through a lot every day – just like our body, it can get built up with old skin cells, dirt and free radicals. Enduring pollution, the sun, and styling on a daily basis – hair can start to become dull and lifeless. When this happens, it could be a sign that your haircare routine needs a detox. New Head & Shoulders Charcoal shampoo with cooling Menthol can help you hit the refresh button on your haircare routine, by detoxifying the scalp, relieving itch and keeping your hair 100% dandruff free. Harness the power of activated charcoal to gently cleanse hair, removing unwanted buildup and impurities to reveal a natural, radiant shine. The new Head & Shoulders Charcoal formula also contains zinc pyrithione and menthol which cools the scalp, leaving you feeling fresh and stimulated. The balanced cleansing delivers a deep hydration. “Whether you’re looking to detox or reap the many benefits of activated charcoal, it is important to make sure that your scalp is 100% dandruff free so it can breathe to grow beautiful hair. Activated charcoal has the ability to pull out the oil, dirt and all the toxins from your hair, leaving you with a detoxed scalp and a detoxed mind for a great start to your day,” said Mai AbdulMaksood at Head & Shoulders. A natural antioxidant, activated charcoal is pure and oxygen is added during processing at extremely high temperatures. This results in a much more porous product with a larger surface area and therefore a much greater ability to remove toxins. Just two grams or four capsules of activated charcoal has about the same surface area as a football field. Which is why activated charcoal is such a powerful detoxifier and has so many amazing uses. What’s more, the cooling sensation of menthol stays with you helping you maintain an air of cool, calm collectedness throughout the day. Head & Shoulders Charcoal shampoo is a must for anyone looking to clear away buildup while getting healthy hair that's up to 100% dandruff-free* and fully refreshed. Leave shampoo on your hair for a couple of minutes and the activated charcoal will work on your scalp the way it does on your skin and hair: pulling out toxins and purifying. 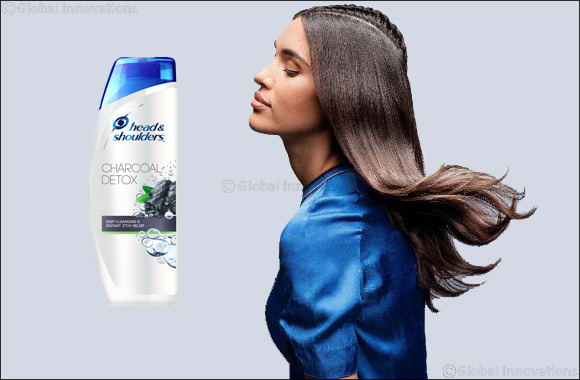 Choose Head & Shoulders Charcoal to detox your scalp and detox your mind!